At front table pictured are l-r; Doris Huggins, Juanita Beauregard and Cynthia Matthews review a map of proposed Edmondson Homesite Park. NASHVILLE, TN — Neighbors of the Edgehill area are using visioning sessions to try to control and restrain efforts by MHDA and the city to sell or develop a site in a historically black neighborhood, which has included a community garden popular with residents and also the 1930s homesite of renowned Black sculptor, William Edmondson. The homesite was demolished to create a school as part of an urban renewal effort in the 1950s. The meeting last week was one of several such sessions where residents discussed potential uses of the parcel of land which runs along 12th Avenue from Wedgewood north several blocks and west over to 14th Avenue South near Belmont College. The area has been under pressure from gentrification and development plans floated by the Nashville government for the land it owns which includes the old Murrell School building. The Edgehill Memorial Community Garden was forced to change locations in 2010 to a different parcel of land because the new Midtown Hills Police Precinct building was built on community garden land. 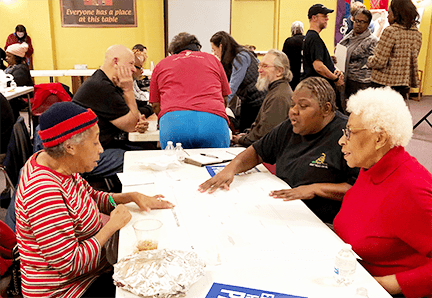 “What burns my britches is they are talking about moving it again,” said Brenda Morrow, President of the Edgehill Apartments Residents Association and director of Organized Neighbors of Edgehill and the United Way Family Resource Center in Edgehill. Metro last year had planned to sell the seven-acre Homesite property to plug a Metro budget shortfall, but neighbors strongly opposed that plan and a substitute site (proposed by Metro Councilman Colby Sledge) was sold instead. “The Edmondson Homesite Park was saved from immediate sale, but it remains vulnerable,” says Mark Schlicher, one of the leaders of a Homesite Coalition – a community group that wants to direct the future of the property. The revisioning groups discussed the potential to move the Edgehill library to the site (with new mental health services provided at the library building), preserving the Edmondson homesite as a sculpture garden, saving the basketball courts that are popular with neighbors, and a playground which might feature a splash pool. “I also think they should have mental health services within the library. Unfortunately, there are only a few places within the community that offer mental health services. I think there should be more,” said Frederick White, a resident of Parthenon Towers who attended the meeting. “Please remember, this is a wish list of what we want it to be. We can’t make promises, but we will do everything in our power to get the things you want for this community,” said Brenda Morrow. Tyson Heller, also a resident of the neighborhood highlighted questionnaire data collected from neighbors and presented a second draft of a “New Vision” plan. “The reason for our meeting is to create a vision, so we can be proactive with a Master Plan instead of reactive to the next plan the city makes,” said Heller. Mark Schlicher pointed out that the issue of protecting the Edmondson site has caught the attention of the National Register of Historic Places and has mobilized artists around the country, including Jennifer Marshall one of the foremost scholars of William Edmondson. “For too long the treasure that is William Edmondson has been taken from Nashville and from Edgehill and allowed to enrich other communities. It’s time to bring him home,” Schlicher quoted an editorial written by Jennifer Marshall. Having a neighborhood with diverse artists and activists has meant that Metro will not easily use the land in a way that ignores the wishes of the neighborhood. “We live a stone’s throw from the park. My wife and I are newlyweds and we’re thinking of starting a family and this would be our park. We’ve seen how vibrant the community is,” said Tyson Heller.